I'm not sure where Dawson picked up the concept of a finish line, but recently when he's been drawing, he'll make a straight line and report that it's a finish line. 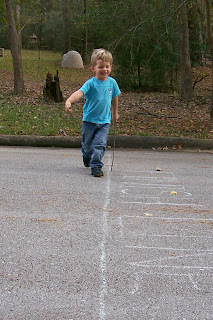 The other day when we were drawing with sidewalk chalk he asked me to draw a finish line. I drew a line from one end of the street to the other and we had the best time playing on that line. Dawson doesn't want to cross the finish line, he wants to actually run on the line - back and forth, and back and forth. Sometimes we'll run fast, other times slow, we'll hop, or we'll walk backwards. It's been a really fun game lately.